You are responsible for the disposal of the household waste produced in your area. You wish to improve the economic, technical and environmental performances of your waste collection and treatment organisation. Your aim is to reduce to the strict minimum the quantity of final residual waste. You are convinced that to succeed in this aim, only an innovative approach, radically different to conventional household waste management systems and widely approved by the population, will enable you to implement sustainable solutions with a positive outcome for our environment. 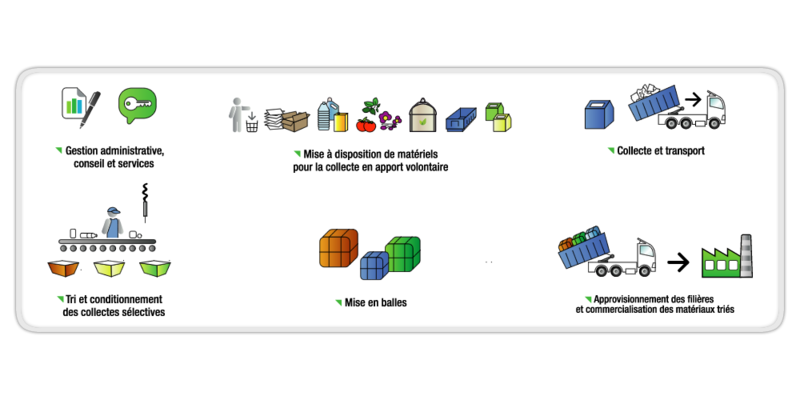 Bring banks in the street or in recycling centres, or door to door collection, loose, in sacks, in bins, multi or single material collection…In France at the present time no particular type of collection is imposed, but feedback is beginning to show some trends. In terms of collection, the Schroll Group has clearly built its offer around the principle of bring collection. Our sorting centres receive waste from all kinds of selective collection of dry household waste. Our marketing team places the recycled raw materials on the markets and in particular within the scope of the "Reprise Option Fédérations" scheme for household packaging waste. When we reply to invitations to tender, we mobilise all the Group's forces: its specialists, its production plant, its outstanding fleet of vehicles, but also its long established know-how, its commitment and its philosophy. Because each local authority is unique, our offers take account of each authority's specific situation, in particular the demographics, the types of housing, the environment, the geographical spread, etc. Security, advice, meeting our commitments and compliance with regulations form the foundations of our relationship with you. Control of costs, the search for new outlets and innovation are the keystones that will enable it to run and develop. The Schroll Group's sorting centres receive the waste from selective collection. This waste is sorted by type of material (cardboard, paper, plastic, steel, aluminium,…) and subdivided by quality. Non-recyclable waste is disposed of. Depending on the sorting centre the waste is taken to, the process is more or less automated: ballistic separators, star bed separators and optical sorting equipment prepares and facilitates manual sorting. Our industrial baling presses allow us to pack the products in bales whose weight must not exceed 1200 kg. Once sorted, most materials are packed in bales as this is the best way of shipping them to the factories which will consume these recycled raw materials. Quality of the contact with the public, cleanliness and tidiness of the site and optimised recycling rates are the strong points of our service. The Schroll Group is able to provide effective support in the administrative management of your selective collection operation. Information on the essential points of the laws and regulations applicable to waste management and the latest developments in recycling. Setting up and running of "Global Info meetings". As an industrial recycler, the Schroll Group has a duty to take strong initiatives in sustainable development. This is how the idea of setting up meetings on the environmental themes came about: an initiative launched under the label "Global Info". Open to local authorities and private companies, run by specialists, the aim of these meetings is to provide concrete answers to the enquiries and questions of professionals on matters concerning recycling and the protection of nature.